A distress call was received from a foreign merchant vessel MV OS 35 (Tuvalu registered vessel), which was attacked and boarded by pirates in the Gulf of Aden late night on 08 April. 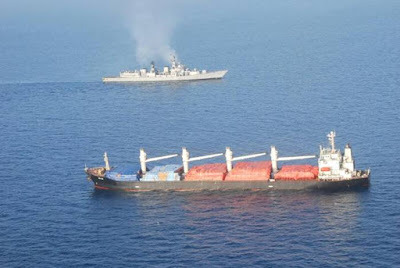 Indian Navy ships Mumbai, Tarkash, Trishul and Aditya proceeding on deployment to the Mediterranean and passing through the Gulf of Aden, responded to the call and rapidly closed the merchant vessel by the early hours of 09 April. The Indian warships established contact with the Captain of the merchant vessel, who along with the crew had locked themselves in a strong room on board (citadel), as per standard operating procedure. An Indian Navy helicopter undertook aerial reconnaissance of the merchant vessel at night, and at sunrise, to sanitize the upper decks of the merchant ship and ascertain the location of pirates, if still on board. Emboldened by Indian Navy's helicopter cover, and on receiving the 'all clear signal' that no pirates were visible on the upper decks, some crew members gradually emerged from the strong room and carried out a search of the ship and ascertained that the pirates had fled the ship at night. Subsequently, in a show of international maritime cooperation against piracy, a boarding party from the nearby Chinese Navy ship went on board the merchant ship, while the Indian Naval helicopter provided air cover for the operation. It has been established that all 19 Filipino crew members are safe. The Captain of the merchant vessel profusely thanked the Indian Naval ships for their response and for providing air cover.